From 1897, when oil pioneer Edward L. Doheny brought in the first well, to the 1940s, the boom town of Olinda sprawled over the surrounding hills. To the north was the Chanslor-Candfield Midway Oil Lease and, to the south, the Olinda Crude Oil Lease. Walter Perry Johnson, of Baseball’s Hall of Fame, spent his boyhood here. 4442 Carbon Canyon Road, Brea. 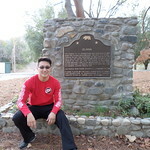 This place is known as the Carbon Canyon Regional Park. It has a hiking trail, tennis courts, playground area, and a lake. I did not do any hiking although I did see many people packing their equipment and getting ready to hike. Many of the available tennis courts were being used. The playgrounds had quite of few children playing. The lake is beautiful with ducks, swans and pelicans roaming around the place. I notice a few people with their fishing rods trying to catch what I assume to be very small fish. I did not get to see the sequoia trees but I believe you have to do some hiking to get to see the trees. I went on a Saturday so there was a $5.00 parking fee.